A consortium of “Kalimantan Forest Monitoring NGOs (RPHK)” in West Kalimantan lodged their protest over the Forest Conservation Policy (FCP) announced by Asia Pulp & Paper (APP) in February. RPHK members found two independent suppliers of APP in West Kalimantan, PT Asia Tani Persada (ATP) and PT Daya Tani Kalbar (DTK), to be still logging natural forest, clearing the land and digging deep peat canals after the 1 February, clearance moratorium date initiated by APP. Point 1 of APP’s Moratorium Clearance Protocol Document stated “Logging and land clearing was discontinued after January 31, 2013. Either in areas of natural forest stands, areas of Open Land (LT) and Young Scrub (BM) until there is verification". On peatland management, APP’s FCP stated “no further canal or other infrastructure activities will take place within undeveloped suppliers’ concessions on non-forested peatland until independent HCVF assessments including input from peat experts has been completed”. Meanwhile, Point 2 of the document stated that “All heavy equipment (A2B) which are used for logging activities, land clearing, road and canal development (corresponding to the list that has been submitted) will be stored in pre-determined areas”. In March 2013, RPHK conducted monitoring on three of APP’s supplier companies in West Kalimantan and found two of them to be still cutting down the natural forest and digging new canals in peatland. These findings are well recorded on videos and photos on how those heavy machineries are still operating in these concession areas. "We are really concerned to see how heavy equipments are still actively clearing natural forest, digging peat canals in two suppliers’ concessions,” said Baruni Hendri, spokesperson of RPHK consortium. “Our findings showed that APP is not serious to implement their conservation policy, thus RPHK – as a part of the civil society – doubts APP’s sincerity in the implementation of their commitment”, Hendri added. "We call on global buyers of pulp and paper to remain skeptical and await independent verification by independent NGOs of the field implementation of APP’s FCP before making any new purchasing decision. Continued forest clearance and peat canal development by APP suppliers without any HCV, HCS and peat study sends a bad signal about the implementation of APP's commitment to conservation that has been broadcasted around the world, " Anton P. Wijaya, Director Executive of WALHI (Friends of Earth Indonesia) chapter West Kalimantan. RHPK commits to keep monitoring APP’s performance closely and to continue to provide the latest updates to the public. Is the new policy announced by paper giant Asia Pulp & Paper' (APP) a milestone in protecting rain-forests? or is it "artful deception" as portrayed by Greenomics Indonesia? According to a report released by the Indonesian NGO, the new policy came after the forestry giant had already cleared nearly all of the natural forests available in its concessions in Sumatra. 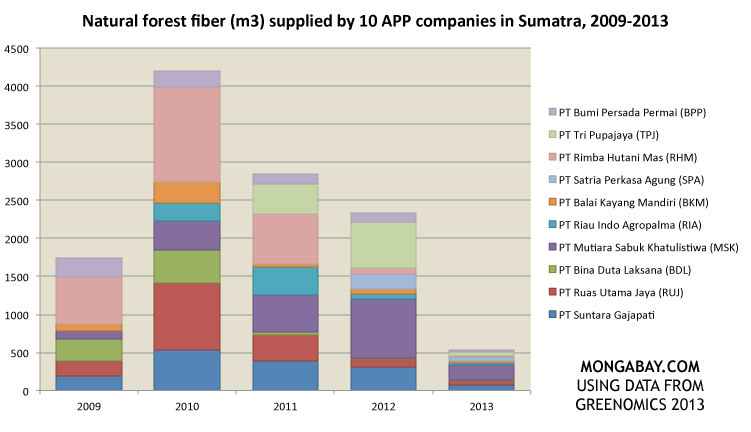 The report is based on analysis of Ministry of Forestry data and satellite imagery for ten APP companies in Riau, Jambi and South Sumatra on the island of Sumatra. Greenomics says satellite data indicate that surviving natural forest and peatland within concessions that supply APP consist of areas that are where the company cannot operate. Accordint to the study, the natural forest and forested peatland that remains in the concessions of APP's suppliers on the island of Sumatra consist of: 1) legally designated protection zones that have been retained with the approval of the Ministry of Forestry, granted long before the launch of the New APP Forest Conservation Policy, 2) areas affected by conflicts with local communities/third parties, 3) areas that are inaccessible due to lack of roads, or 4) areas in respect of which repeated attempts at clearance have been made, but to no avail, such as in the case of anticipated criticism of the clearance of deep forested peatland which was later turned into a protection zone with the approval of the Ministry of Forestry. Greenomics argues that the findings suggest that APP waited until after it had cleared as much forest as possible before establishing its forest conservation policy, which limits conversion of high carbon lands, high conservation value forest, and conflict zones. "It would appear that commitment to the New APP Forest Conservation Policy was delayed until the clearance of natural forest and forested peatland for the development of pulpwood plantations had been completed." concludes the report "The natural forest fiber resulting from such clearances has come in very useful as a source of raw material for APP operations, particularly for 2013." "Between our APP team, The Forest Trust (TFT) and HCV assessors, we have over 200 people working on the ground right now," Aida Greenbury, APP Managing Director for Sustainability, told mongabay.com. "They are tasked with mapping natural forest boundaries and the complex process of HCS and HCV evaluations." "Our initial satellite image analysis on the 15 concessions which were converting natural forests prior to February 1st 2013, shows that, as a result of our Forest Conservation Policy, there are substantial natural forest areas left protected throughout Sumatra and West Kalimantan. We will continue to report our progress as each element of our program is completed." Greenbury added that initial analysis from TFT suggests the amount of forest which will be protected as a result of the new policy is between 150,000 and 250,000 hectares across the two islands.